Tx Scrapper Mom: A Flowery "Pick-Me-Up"
A good friend of mine is resting in bed after having surgery, and I thought a simple 'get well' card wasn't enough. So, I decided to make her something happier - something that just screamed summer - since we both have a wonderful, and well deserved summer vacation ahead of us! If you can't read it, because my picture-taking abilities aren't quite what they could be, it says "If friends were flowers, I'd pick you." Love the message and love the flower! I'm cricaholic from the MB...following your creativity-Hi! This card is delish! Bright and cheery as only a summer day can be. Great job! 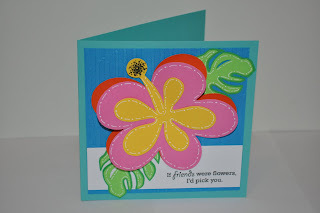 What a bright, cheerful card! I just love those vibrant colours!